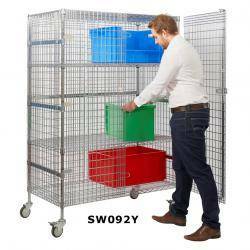 A well manufactured wire shelf security enclosure ideal for securely storing items whilst ensuring they are easily viewed. All the units are supplied complete with 2 deep height adjustable shelves for extra capacity & stability. The trucks are fitted with 4 swivel 100mm rubber castors of which 2 are braked for your ease of use when moving them around. For security a hasp & staple lock is fitted as standard (padlock not included).